PHILADELPHIA (WPVI) -- Chick-fil-A customers in Philadelphia can order a new, spicy meal, but only for a limited time. 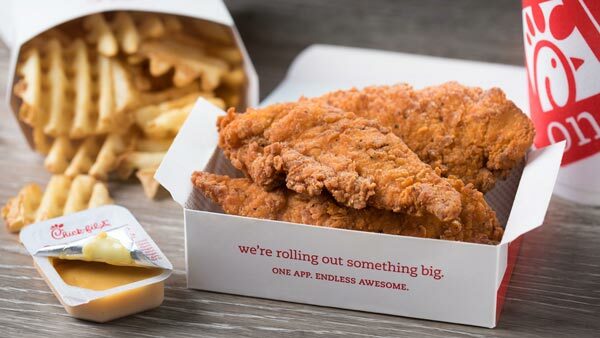 Chick-fil-A is testing its new Spicy Chick-n-Strips in participating locations in Central Texas, South Texas, and right here in the Philadelphia area. "The new Spicy Chick-n-Strips combine two customer favorites - the Spicy Chick-fil-A Chicken Sandwich and the original Chick-n-Strips - with a bold new entrée that's packed with flavor. The strips are seasoned with a spicy blend of peppers, hand-breaded and cooked in 100 percent refined peanut oil." Chick-fil-A tells Action News the Spicy Chick-n-Strips will be on menus likely through early 2018. "We are excited to hear what customers think about our new spicy additions during the test," the restaurant said. They tell Action News, once the test concludes early next year, they will evaluate feedback from both customers and restaurants to determine whether or not this offering will launch nationwide. "We don't have an exact timeline, but our hope is that the test is successful and we can look forward to a national rollout," Chick-fil-A said. The Spicy Chick-n-Strips are available in 3-count or 4-count entrees, and can also be ordered in catering trays. A 3-count order has 340 calories and 26 grams of protein, and starts at $3.85. Meantime, if you stop at Chick-fil-A restaurants in Orlando, Fla., St. Louis, and Knoxville, Tenn., you could try another limited time menu item the chain is testing out - the Grilled Spicy Deluxe Chicken Sandwich. So why is Chick-fil-A testing out these new spicy chicken additions? "Research indicates that 48 percent of consumers are interested in trying chicken entrees with new or unique flavors, and preferences for spicy flavors are growing, particularly among millennials," the restaurant said.